How did the Czar maintain his iron grip on the Russian Empire? How did the Czar defeat those who would destroy him and his dynasty? The answer is simple. He ate them. That's right, the Czar ate his enemies, and we Kalebergs celebrate Russian Easter by having a chow down of our own. We too eat the Enemies of the Czar. Mix up the dressing. Adjust the seasoning to taste. Don't even bother with any of the Russian dressings you'd find in a jar. They are wretched. Make the real thing. (The quantities listed above are approximate, so feel free to experiment). Heat up the panini maker with the scalloped or waffled plates, if you have them. Lay out the four slices of bread. 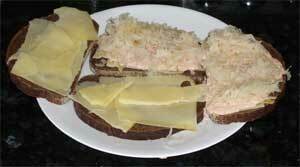 Cover each of the four slices of bread with the cheese. 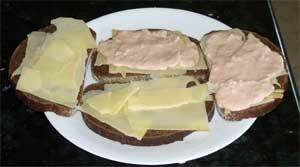 Coat two of the slices of bread with the dressing. Squeeze the sauerkraut by the fistful to drain it. Cover the dressing with sauerkraut. 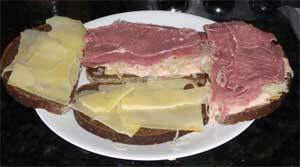 Lay out the corned beef on the sauerkraut. 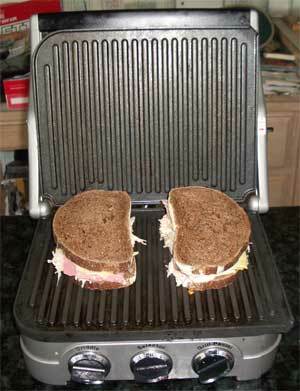 Close the sandwiches and put them on the panini maker. Press and hold the handle down for a minute. Then let them cook another two to four minutes, until the cheese is melted and the bread is toasted. Cut finished sandwiches in half. Eat to the health of the Czar. (Yes, we know that this didn't work too well in that the Czar was overthrown by his enemies, but you will get a satisfying feeling as you chow down on these enemies, just as the Czar did in his day). 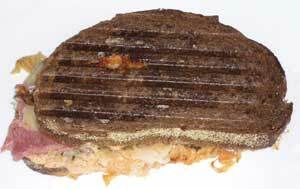 Yes, we realize that the Enemies of the Czar are basically panini grilled corned beef Reuben sandwiches, but this is as one would expect given that the Czar was a notorious anti-semite. We all know that Trotsky died in Mexico City after being assaulted by one of Stalin's goons on August 20th, 1940, but as best we can tell the wound was superficial. Trotsky was already in ill health from eating a diet of this delightful dish which is now known as Trotsky's Bane. Homesick for Russia, Trotsky tried to make do with Japanese fish eggs and in lieu of gentle vodka, cucumber cups full of nasty tequila. While Trotsky has long since been discredited and is without honor in his homeland, we can still enjoy a taste of the treat that led to his downfall. 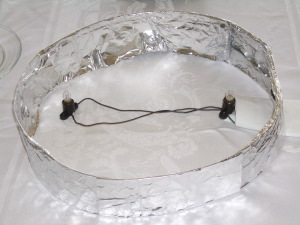 an attractive illuminating dish for glow in the dark display (see here and here). Peel the cucumbers. Cut off an end and gouge out a cavity with the melon baller. Slice off the end so that you form a little cup. Repeat until the end of the cucumber. Repeat this with the next cucumber. We get around 7 or 8 cups per cucumber. Put a teaspoon of tequila in each cup. 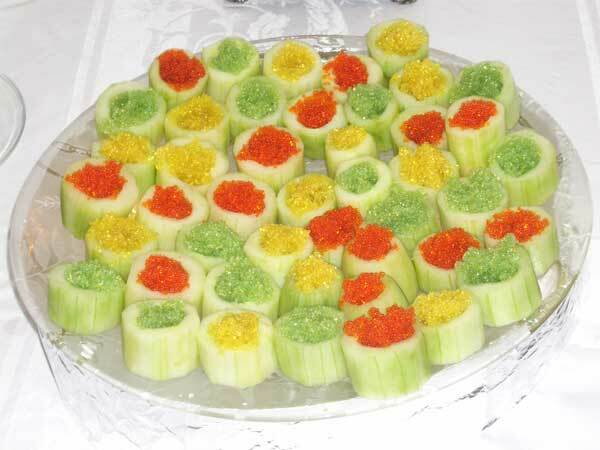 Put a teaspoon of tabikka in each cup. Array the cups attractively on an illuminated dish if you have one so that they glow eerily. Play some theremin music to really set the mood. We are no fans of Trotsky, so we drink to his ill health with this delightful and refreshing dish. While only the oldest among us remember the depradations of the monster Napolean, who laid waste to much of Europe, and France in particular, only the oldest and hardiest of us remember the brilliant defense of Moscow that stopped the little emperor cold. 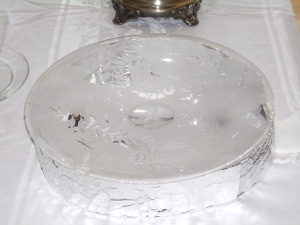 The dessert shown on the left weighs 8 million tons, only a bit less than the actual city of Moscow during that bitter winter of 1812 when the Corsican sent his hordes east. Who could stand before him? Who could stand after eating this dessert? Read the recipe and discover the truth about The Defense of Moscow. 6 pounds of good coffee ice cream - We go for Coldstone Creamery. You can make this whole thing up in advance and freeze it, meringues and all, then bring it out for the big event. That's what we do. INSTRUCTIONS FOR THE BROWNIES - DO THIS SIX TIMES (More if you eat the brownies as you make them). Rig up a double boiler and melt 5 tbsp of butter and 3 ounces of baking chocolate in it. Mix 3/4 cup of sugar and two eggs in a big bowl. Whisk the melted butter and chocolate into the sugar and egg mix. Add 1 tablespoon bourbon and 1 teaspoon of vanilla. Dump in 1/2 cup flour, 1/2 teaspoon baking powder and 1/4 teaspoon of salt and whisk the whole batter together. Butter a 9 inch square baking pan and dust it with flour. Fill the pan with batter and bake for about 20 minutes. The cake is done when a knife inserted comes out dry rather than coated with cake goo. Let the cake cool and then flip the brownie out of the baking pan. In a large bowl, mix 1/4 cup egg white powder and 3/4 cup water. Add 1/4 teaspoon cream of tartar and 1/4 teaspoon of salt. Beat until the mixture is foamy, but not quite to the soft peak stage. It should have big bubbles, not fine ones. Add 3/4 cup of sugar and 1 teaspoon of vanilla extract. Beat until it forms stiff peaks. Spread the mixture out on a Silpat pad and put it in the oven to bake for about an hour. To build the city of Moscow, lay out about one and a half again brownies on a serving tray. Cut two to three inch high walls from the remaining brownies to build the city ramparts. Cram the entire thing full of coffee ice cream. Work quickly so that you don't eat all of it before you have it assembled. Lay out the three layers of meringue across the top. Put the city in the freezer so it stays cold, just like Moscow in the winter. Cut out onion domes (not minarets, sheesh) from the remaining brownies. It works best if you start with the pointed tops, then do the rounded sides. Make up a mix of confectioner's powdered sugar, a few squeezes of lemon, and enough water to make a thick icing. Paint the tops of the onion domes with this. Prop these up so the icing dries properly. For the final assembly, stick toothpicks in the base of the onion domes and shove them into the top of the city so it looks like St. Basil's at the Kremlin. Heat up a metal pot. Tell everyone about the perfidy and vile ambitions of the evil monster Napolean and describe his assault on Moscow. "But the Russians had a plan to hoist the Frenchies on their own petard". They let the French take the city of Moscow. Pour a whomp of cognac, French brandy, into the pot. Let it warm for a few seconds, then blast it into flames with the blowtorch or a match. "Scorched earth", the Russians cried, though who could really tell. This was Russia in the winter. Pour the flaming brandy on the city of Moscow. Even the French weren't that keen on starving to death in a city destroyed by the flames of French brandy, so they hightailed it back to Paris. We Kalebergs, of course, know what happened next. The victorious Russians returned to Moscow and ate the city. The French might not think much of Baked Alaska, but true Russians think the Kremlin is scrumptious. If you are an American, you may be familiar with this dish as a variant of Baked Alaska, but where do you think the Alaskans got the idea? © Copyright 2006 - Kaleberg Symbionts - All rights reserved.